Nobody answered KNOCK KNOCK LIVE. 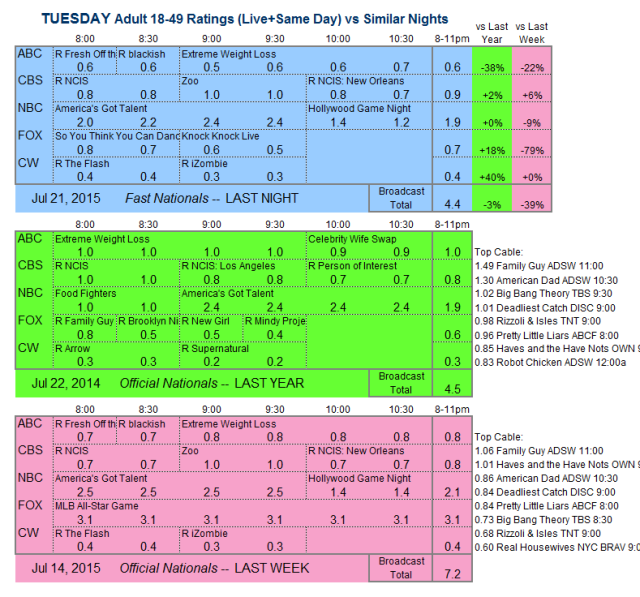 FOX: KNOCK KNOCK LIVE debuted with an unpromising 0.5, following 0.7 for a SO YOU THINK YOU CAN DANCE clip show. NBC: AMERICA’S GOT TALENT ran away with the night at 2.3, although that was down 0.2 from last week. HOLLYWOOD GAME NIGHT declined by 0.1 to 1.3. 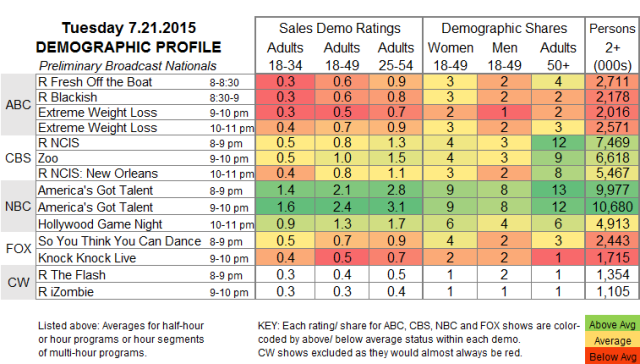 CBS: ZOO maintained its 1.0, higher than the 0.8 reruns that sandwiched it. ABC: EXTREME WEIGHT LOSS lost 0.2 to 0.6, the same as the reruns that preceded it. Tonight NBC returns LAST COMIC STANDING to the air, and FOX launches HOME FREE. In addition, CBS moves EXTANT to a new 9PM slot, where it will have BIG BROTHER as its lead-in.